Throughout the year, About Flowers provides an extensive assortment of flowers and plants supplied directly from the flower auction on a daily basis. During purchase, we strive to follow the latest trends in floral design in order to create the most beautiful bouquets and arrangements, whether they be modern or traditional. About Flowers guarantees 5 – 7 day freshness, depending on the type of flowers, the climatic conditions and the care they receive, though many flowers may last longer! Despite the care we take in selecting only the freshest of flowers, it happens occasionally that flowers wither before they should. In this case, please contact us as soon as possible and we will do our best to replace the flowers. Plants and flowers help create a pleasant atmosphere in our home and at work and their presence can determine the desired ambience. We are happy to drop by to discuss the right colours and floral designs for your interior. 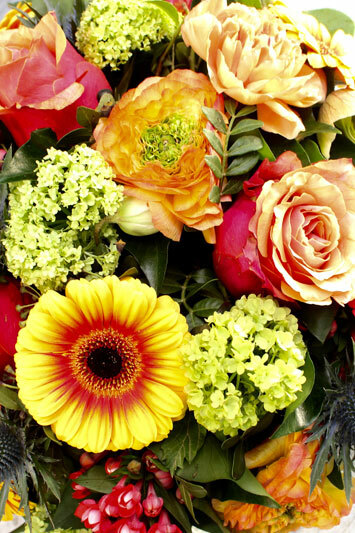 About Flowers has its own delivery service for a large part of The Hague region, and is affiliated with Interflora for outside this area and for international deliveries.